Berghahn Books - Diversity vs. National Community: Who wins in Scandinavia? Anders Hellström is the author of Trust Us: Reproducing the Nation and the Scandinavian Nationalist Populist Parties. Read the introduction for free here. The Scandinavian countries are similar, yet different. Sweden, Norway and Denmark share a similar socio-political development, but they feature three different discourses on immigration. Today with the current refugee situation, it remains to be seen if these countries will converge more on this issue as well. Everywhere on the radio, on television and in the newspapers there are discussions on how to handle this situation. It deals with the fundamental question of how previously more homogenous national states should tackle challenges of diversity. Trust Us offers an in-depth understanding of the historical consolidation of liberal-democratic national states and the formation of universal welfare states in Scandinavia. This provides a backdrop to the current challenges of diversity and also the current refugee situation. Whereas most people would like to welcome the refugees and help the asylum seekers in every possible way, there is also many in the electorate who worry about this development and instead prefer tighter bonds between the state, the nation and the (national) people. They would perhaps like to help “the others”, but first they focus on helping their own people instead. The image of the refugee in need of help or as a potential burden prevails and the discussion in civil society is polarized between efforts to helping “them” or “us”. If anything, the current refugee situation reinforces ideas of who we are and what we would like to become. At the same time all across Europe, politicians are paralyzed, and instead of finding a joint solution to the situation they try to be as unattractive as possible to avoid the asylum seekers seeking asylum in “their countries”. This is also the case with Scandinavia. The book is about how these fissures in public opinion transmute into party political preferences in this region. 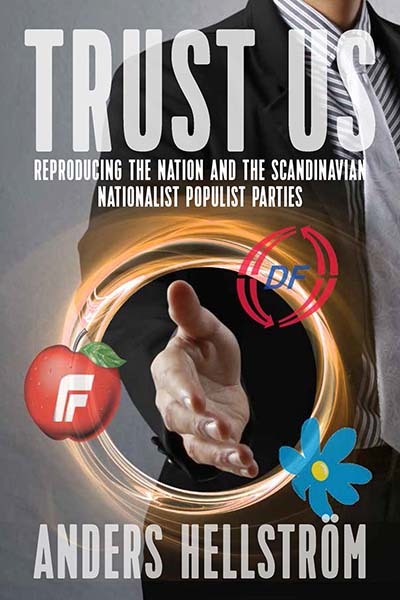 Trust Us focuses on three nationalist populist parties in Scandinavia—the Sweden Democrats, the Progress Party in Norway, and the Danish People’s Party in Denmark; how these three parties endeavor to establish a niche between the demand in the electorate for a more restrictive immigration policy and the supply side of political competition. In order to affect domestic politics by addressing this conflict of diversity versus homogeneity, these parties must enter the national parliament while earning the nation’s trust. They need to cross not only the parliamentary threshold, but also the threshold of credibility in order to impinge on domestic politics. My results show that out of the three, the Sweden Democrats have yet to earn the trust of the mainstream; articulating their concerns from credible ethos-positions. Considering the period when my analysis was made, before the current refugee situation, the SD was already popular among the voters, but the editorial writers were unanimously very negative of the party and the other parliamentary parties refused to engage in collaboration with them. Does this mean that we are confronted with a democratic problem, that the voters’ voices are not recognized by the representative elites? Not necessarily. Any party with less than 50 per cent of the votes need to collaborate with one or several other parties in order to turn their political programmes into actual policy making. The debate on immigration is both highly emotional and polarized. Nobody would like to be a populist, but all politicians would like to represent the “common man” versus “the elite”. We should remember that the common man is a site of struggle, and it is not always clear what his or her interests are, though. The SD, DPP and the PP articulate a vision of what unites the nation. This is a nostalgic vision. Indeed. But what my results show is that also the so-called mainstream parties need to articulate visions of the future that the voters can relate to, and thus not merely pursue politics by technocratic means. Read more about Trust Us: Reproducing the Nation and the Scandinavian Nationalist Populist Parties here. Anders Hellström is Associate Professor in Political Science at Malmö Institute for Studies of Migration, Diversity, and Welfare. His research has been published in journals including Government & Opposition, Journal of International Migration and Integration, and The European Legacy.